LAKE BUENA VISTA RESORT VILLAGE. Please Contact for best rate as rates do tend to fluctuate during seasons. Lake Buena Vista Resort Village & Spa is superbly located one mile from Walt Disney Theme Parks, minutes from Universal Studios and SeaWorld, and only 15 minutes from the Orlando International Airport. Are you a fan of Disney + Theme parks? Free daily transportation/shuttle service is provided TO AND FROM the multiple theme parks! This is a great way to begin your Orlando holiday adventure! Shuttle Service is included with your Resort Fee, on a first-come, first-served basis ONLY. Reservations are required one day in advance. Resort Management is not responsible for any missed shuttles, and guest will not be reimbursed for any transportation charges resulting from a missed shuttle. If you miss your shuttle, please call front desk to arrange a private pickup at your own expense. Note, please verify the timing with the resort! Only a few steps from your luxury condo hotel is one of Orlando’s Outlet Malls – Lake Buena Vista Factory Stores,with over 238,000 square feet of factory-direct brand name stores. Upon arrival at this Resort, a coupon book worth up to $400.00 in coupons. This Condo comes completely equipped with a washer and dryer, stunning kitchen facilities include all appliances and cooking utensils. This kitchen is outfitted with brand new Granite counter tops. The stylish living room is outfitted with a comfy sofa sleeper, & large HDTV for your viewing pleasure. Every bedroom has its own TV (Full cable access) and ceiling fan. There are two master bedroom suites with king-size beds as well as one bedroom with 2 single beds. Our spectacular zero-entry pool featuring a pirate ship complete with shooting water cannons and water slide, a poolside bar, Jacuzzi style hot tubs, tumbling waterfalls and hammocks. In addition to all the amenities provided in the Resort Village, it is minutes away from Orlando's wonderful Golf courses and other nearby Outlet Shopping malls on International Drive. *Free scheduled transportation to Disney, Universal and Sea World. *42-inch HDTV in living room. *20-inch TV in second and third bedroom. *All bathrooms have built-in hair dryers, lighted makeup mirrors, tile floors, and granite counter tops. *Kitchen has full size refrigerator, garbage disposal, Granite Counters, dishwasher, full oven, and microwave oven. *Individually controlled air conditioning and heat. *Jacuzzi tubs and walk in showers in master bedrooms. *Alarm clock radios in all bedrooms. *Heated Pool year around, hot tub. 1. Is there Internet available? Yes! Free Internet is provided either in room (Wired broadband connection) or WIFI is available around both pools, Lobby, Fitness Centre + Rec Room. 2. I have a young baby travelling, is there a crib available? Yes! Cribs and play-pens are available through the Resort’s Front Desk, and would love to help you. Unfortunately at this Resort, pets are not allowed. 4. How do I get to and from Disney and the Theme parks? At your convenience, the Resort provides free shuttle service to Disney World and the Theme parks daily for free. Make sure you reserve seat on the shuttle ahead of time. 5. I really enjoyed the stay at your condo, are discounts available for referrals? Of course, we love to have new guests stay at our Condo, and if they mention your name we would gladly offer them a discount rate. Keywords: Disney World, Lake Buena Vista, Resort, Orlando, Florida, central- Disney, spa, vacation, rental, hotel, condo, cheap, 3 bedroom two bath, Balcony, pirate ship, Mickey Mouse, Universal Studios, Free Wifi, Irish Pub, Outlet mall, Free Disney Shuttle, Golf. My wife and I bought these units for our retirement years as we currently live and have a business in Canada. We are sure you will LOVE this Condo and the Resort. We thoroughly enjoy staying here. 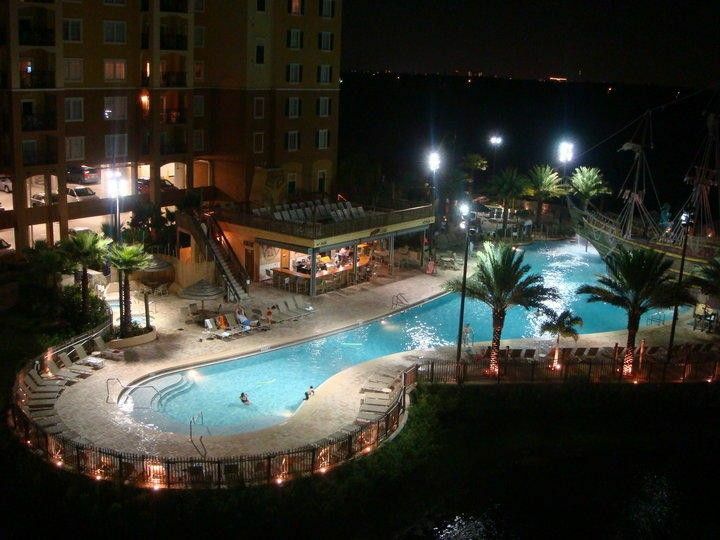 Lake Buena Vista rated #7 resorts of Orlando and Floridays rated #1 resort of Orlando . Great Reviews on Resort available upon request. It is a resort Hotel, ideally located. Clean, luxurious and professionally run. 2 Pools and steps away from a fabulous Outlet Mall and magically close to all attractions with free shuttle service provided. Having stayed at this condo personally with my family, it is perfect fun for all ages. These units are located in Building 3 and 1, and has pool and Garden view. in building #1, its on the 8th floor with pool view, in building #3 it is on the 5th floor with Garden and Fountain view. Moreover, we have quality suites with the spectacular view which you and your family would enjoy. you will have free shuttle service to Disney World,Sea World and universal studio. Are you looking to stay at Floridays, #1 resort advised. we have a 2 Bedroom suite and a 3 Bedroom suite there as well to serve you. Convenience store, pizza hut, Pirate Pool with slide through the ship into the pool, Spa in Building. Irish Pub in the Resort on the main floor. Free internet(Wired + WIFI available!) and Free Shuttle to and from Disney and other theme parks. Minute drive to Walmart and many other restaurants and food stores. Free shuttle service to World Disney and Unversal studio and Sea World. Free Internet Services, Next to Outlet Mall. Computer: Computers are available for use in the Lobby - Building 1. WiFi (Wireless Internet): High speed internet available around both pools, lobby, and Building 1. roadband Internet: Hi speed Wired Internet access available in living room. Shared Pool: Two pools, one pool features a Pirate ship and slide for Kids! Free Wifi are available by both pools. Each of the Bedrooms and a Large HDTV in the Living room for your viewing pleasure. Full cable. Covered Parking: First come first serve or plenty of parking all over the parking lot. Very close to everything and nice to have two pools. The property was nice. Only issue is the two of the burners on the stove didn’t function. May recommend that they at least stock salt and pepper. Everything else was great! Comfy beds. Nice to have washer/dryer in unit. Would definitely go back to this property. Second visit there. Excellent my only complaint would be it was chilly in Orlando and extra blankets would have been nice in the rooms. Overall excellent! Very clean well maintained property. Great location. $800 to $1000 a week US, Canadian, Pounds, Hey There! - Please contact me for the Best rate. Discounted Rates vs Posted Rate of the Resort; Lake Buena Vista Village and Spa + One Night Free stay after six redeemed on your next visit with six day minimum booking Amex, VIsa, MC Dates Available: Year Round - Please inquire within!